[Zurich]: Burton Y. Berry, 1972. Fine in photo-illustrated laminated boards. Highly sought after and prized since its discovery.. First Edition. Quarto. Privately printed for Berry by C.J. Bucher, Ltd., Lucerne, in an edition of 300 copies. Preface and text by the photographer. 78 pages, 63 full-bleed black and white photographs. One of the great unsung and virtually unknown photobooks of the 60s and 70s. The photographer, Burton Y. Berry, was a career diplomat and an obsessive collector. Influenced by attending a Beatles concert in 1965, Berry sought to understand and document youth culture by photographing mostly male youths in Zurich, where he was stationed. 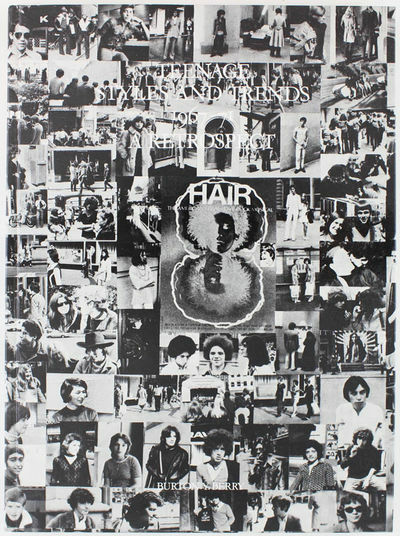 While the idea was to capture the hairstyles of his subjects, what unfolds page by page is nothing short of a forensic sweep of European youth fashion and culture at the apex of the sixties. The book could be dismissed as amateur hobby, but Berry was an excellent photographer, book designer, and chronicler of his surroundings. (Parr / Badger, v3, 80).